Whether your wedding theme is ivory, pink, purple or gold, we know how important it is that your wedding colour is complemented by a tasteful, beautiful and well-coordinated invitation. We have a wide range of colourful wedding invitations and matching stationery in a rainbow of shades, tones and styles, perfect for any bride or groom. Use the left hand navigation and click your chosen colour to display the wedding invitations in that range. 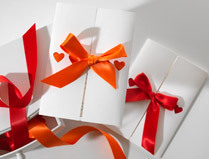 Be bold with red invitations or vibrant orange invitations to warm your guests! 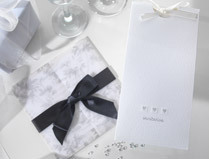 A spectrum of black or white invitations ooze tradition, class and style. 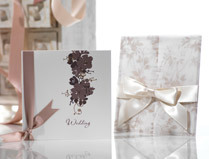 Regal purple invites or plush, indulgent pink invitations have an heir of love. 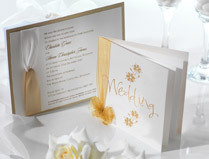 Opting for yellow or gold invitations can look expensive and suit any theme. 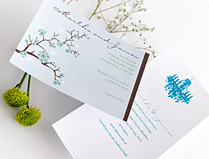 Choose blue invitations or green invites for a colourful stationery theme. Neutral and brown invites suit all wedding themes with soft creamy neutral tones. 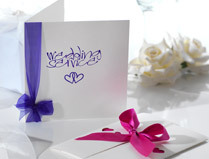 Continue your search for the perfect wedding invitations.